How to start a blog and work from home! 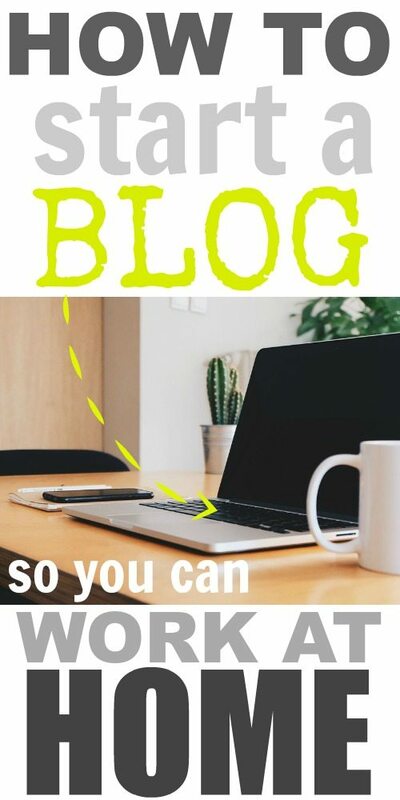 If you’ve been wondering how to start a blog of your own, here are the step-by-step instructions so you can get up and running with it right away! I’ve been blogging for about five years now and it really has completely (completely!) changed my whole world. I’ve been able to enjoy earning a great full-time income while still being able to be home with my family as much as I want to and keep up with all the crazy-busy stuff that goes on when you have two kids with school, sports, friends, etc. If you’ve been thinking about how to start a blog and work from home, then this is the post for you! I’ve been talking for awhile about how great I think blogging and working from home are, why I think everyone should have a blog, and I’ve shared our story about how we quit our jobs in the big city and moved out here to the country, but today I thought I’d show you just how to start a blog if that’s something that you’ve been interested in doing. Let me tell you: If you’re at all able to string a sentence together, you should be interested in how to start a blog! If you’ve never started a blog before, and you feel like you’re not a very “tech-y” person, don’t worry. I’m going to walk you through this step-by-step and make it super easy-peasy. To have a blog on the internet, you need to have someone host you. Your host is someone that gives you your little plot of internet land on which to build. There are a lot of blogging platforms out there, like “blogger”, that will host your blog for you for free, but with them you never really have full ownership and control over your blog. I started out on blogger, and while I liked it just fine for awhile, I ultimately ended up needing to get my blog set up in WordPress, find myself a host, and go through a whole re-design to really grow my blog the way I wanted to. Of course, I ended up needing to go through all of this when Jack was just a teeny tiny baby and I had no time to go learning all of this new stuff, so I ended up paying someone thousands of dollars to help me with it all. In the end, I could see how much my not starting on WordPress and not being self-hosted had really stunted my growth and I wish I would have just started out doing things the right way. But I didn’t know! There was no one to tell me all of this back then, which is why I’m making sure that I’m telling you now! I recommend using Bluehost as your host when you start your blogging journey. First of all, the price is pretty outstanding. No one should have to invest a whole lot of money when they’re just starting up a blog and testing to see if it’s really something that you fall in love with and want to do on an ongoing basis. I love that with Bluehost, you can get your blog up and running for about the price of one cup of coffee every month. You can get that special deal by clicking here to get started, or by clicking on the link in my step-by-step directions below! Their customer service is also really great and that’s so so important if you’re not particularly techy or if you just feel like you don’t really know what you’re doing yet with this whole blogging thing. You want to have someone that you can actually reach to answer your questions and bluehost offers both an online live chat and a phone option. It’s so nice to be able to talk to actual person for some things! When you’re ready to get started, click here to open the Bluehost page in a separate tab automatically. Don’t worry, I’ll still be here to walk you through everything! See that big green button there? Click on it to get started. Choose the plan that works best for you, but if you’re just starting out, the starter plan is an incredible value. You have the option to pay for 36 months to get a great deal and you definitely want to do that. Blogging is definitely more of a marathon than a sprint and you’ll find yourself getting better and better at it as the months pass. It also doesn’t hurt that the longer you’re around, the easier and easier it is to grow your reader numbers. If you told me two years ago that I’d be getting the numbers that I’m getting now, even during times where I’m a little too busy to blog as much as I’d like to, I’d have said you were crazy. But that’s the way it works! Time is definitely your friend, and you want to think long-term. Of course it’s totally possible to have a really successful blog right from the start, but things will only get better with time! Your domain name is basically what your blog will be called. In my case it’s the “creeklinehouse” in www.creeklinehouse.com. It’s almost always a good idea to pick a name that’s a little bit non-specific when it comes to a blog so that you have the freedom to cover any topic that you feel like writing about without it looking strange. If you pick a non-specific domain name, you’ll also be able to switch directions with your blog at any time without having to completely restart with a whole new domain. A lot of people like to simply use their first and last names as their domain name, or you can just do like me and name it after your house if you want to talk about a whole bunch of different things that all happen at your house! The first thing you need to do, after creating your password, to set up your hosting account is to install WordPress on your website. This is the thing that will actually allow you to post content on your site, control how it looks…. and basically everything else! The good news is that you can do this really easily right on your Bluehost dashboard. Just look under the header that says “Launch Your Site” and click on “Launch”. 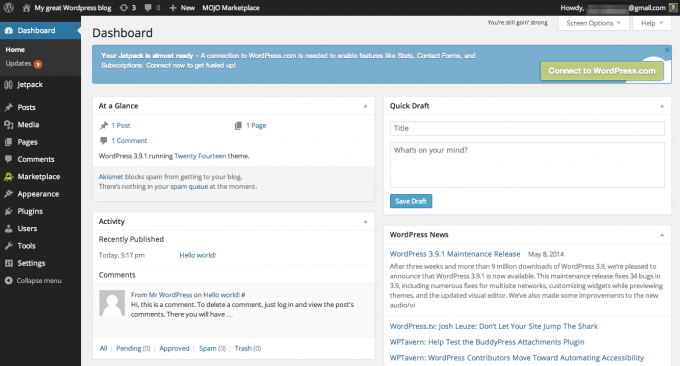 You’ll be taken through the steps to install WordPress and then you’ll be good to go! 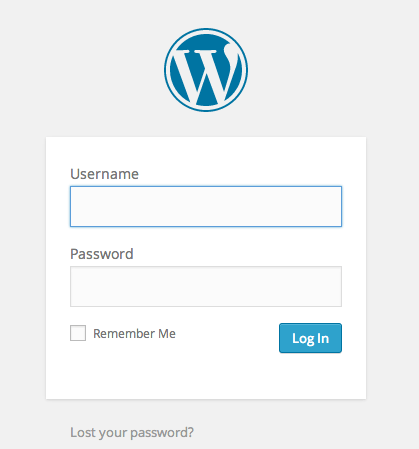 After this point, you’ll access your blog by logging in directly to WordPress. Your login page will be www.YourBlogName.com/wp-admin. You can just type that into your browser to login at anytime and from anywhere! Here’s how that log in page looks! If you want to start your blog on the right foot and have as good of a chance of looking like you know what you’re doing-ish from the start, you’ll need to purchase the Genesis framework and a child theme. Genesis is sort of a base that a whole bunch of blog templates function off of and the child theme is the actual template that makes things work. You don’t want to go with one of the free themes. In fact, once you go ahead and buy Genesis and your child theme, you’ll want to go back and delete all the other themes on your blog. Word on the street is that a very popular hack is getting in through those freebie themes! If you want to know a little bit more about how all of this Genesis and child theme stuff works, StudioPress has a great document for absolute beginners that I love. Once you’ve taken these steps, you’re basically set up! You can start playing around and customizing the way your new blog looks and then, when you’re ready, go ahead and click on “Posts” in the sidebar, then “Add New” and you’ll be writing your first blog post! I really really recommend that you read A LOT while you’re just figuring out how to start a blog and throughout your blogging journey. There are so many individual bloggers out there who offer tips and tricks on everything from really really beginner stuff, to all of the latest and greatest in what’s going on in the world of blogging. No single blogger of this type really has the ability to cover everything and every blogger explains everything in a slightly different way, so I don’t really recommend any one single blog to read on your blogging journey. What I do recommend though, is going into Pinterest and searching for whatever answer you happen to be looking for and you’ll always come up with tons of really great reading material. (My Pinterest board called TRICKS AND HACKS: Blogging is a really great resource too!) You can just scroll through all of the images for the options that come up in your search and easily choose which one appeals to you most. I really find that this is the most user-friendly way of finding the information that you need, written in a way that you can actually understand, without having to wade through a whole bunch of overly-complex or just plain unfriendly webpages first. You could type in something like “How to write a great blog post” or something like “New blogger tips” or “how to start a blog”… or just about anything else! There’s always so much to learn in blogging, even if you’ve been doing it for years, but the good news is that you can keep things as simple as you like and then try new things when you’re ready. If you’ve already followed the steps that I’ve outlined for you above for getting set up in Bluehost, then you already have everything you need to get started with writing posts and building an audience! Please reach out to me with any questions that you might have about how to start a blog along the way! I’ve been so lucky to be a blogger these last 6.5 years and if you think it’s something you’d like to try too, then I’d love to help you get started! More posts to help you along the way! How to quit your job in the city, move to the country, and live the life! How to accomplish big things when you have absolutely no free time! How do you make money blogging? How don you get sponsors? Hi Patty! I definitely have a lot of tips about both of those subjects! There are so many ways to go about doing both that I really think that almost anyone can be successful at it. They just need to find the method that works for them. I just added both of those questions to my list of posts that I want to write soon! Thanks so much for stopping by and saying hello today! 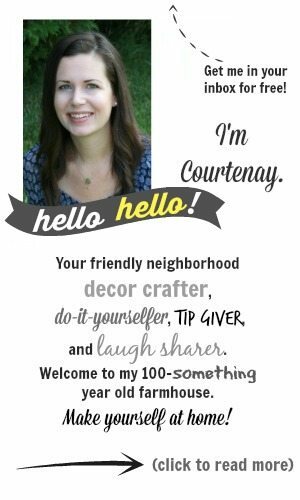 Hi Courtney – why are you able to grow your blog more if you are self-hosted? I am currently using blogger and your post has me really interested in possibly making a change. Thanks for explaining all of this in an easy to understand way! Hi Joanne! Being self-hosted pretty much means that your options are unlimited. You own everything about your website completely and it can never be randomly shut off on you. You’re also able to use all kinds of different plug ins to make your blog better in almost any way that you can imagine AND use custom themes to make your site look and function however you want. Beyond that, since I’m someone who uses a lot of photos, I remember running out of space on blogger pretty quickly and needing to figure out how/where I could buy more space to store photos and files and how to make sure I could get them to work easily on my blog. And about a million other reason, but those are some of the big ones for me. 🙂 Basically, if you’re putting all the time and effort into your blog, and especially if you’re going to be making an income from it, you want to give yourself the security of owning everything about it. I stumbled across your blog and was intrigued, delighted, and so grateful that you generously offered so much insight – i have also shared many ideas overs the years to help others cash in, but now that Im in my 50s, I need to be more selfish and have a timeline as no retirement savings. As a woman, I have always earned much less than the men I work side by side. Im well educated so during the past 5 yrs, I simplified my life so I could at least work from home and have the “brain power” with less financial and city social pressure. I moved to a semi rural area, reducing my bills in 1/2, my son is finishing university, and I can walk 10 mins to buy groceries. Life is calmer. I have much wisdom in 5 primary areas: Automotive sale/business/recruitment, Home Staging, Yoga, Financial Collaboration, Eco-travels/Vegan and that I wish to blog about all and write a book about each topic. What has been holding me back was always the f/t job, raising a family alone, shoveling snow, and my wellness side-line business (to cover business write offs and all the extra outrageous bills living in the city). 1) How on earth can my blog generate income? Must I market it to Automotive dealership,s for example, that would be a f/t job, and i work f/t already recruiting for auto dealerships from home – its more than f/t – so I’m thinking if I could turn the blogging into a helpful linkedin friendly blog that would attract future candidates, it would cut out 90% of my 50 hour work week spent searching for viable candidates, and then I could start my book. 3) How do I make it profitable day 1? Thank You for all your information but I was recently laid off work and I am very interested in starting my blog. At the moment I have no extra income to compensate for start up cost. Is there any other options to start a Blog with my situation? Hi Traci! I think most people who want to make a blog for free are using blogger these days. You will eventually want to move over to WordPress though, if you’re serious about using your blog as a business, and that can be costly if you need to hire someone to do it. You may find that it’s worth the small fee for hosting now to get your blog started on WordPress so you never have to move it. Good luck on your blogging adventure! Hi, I just started with my website and thought maybe you would like to take a look at it. Love your hints/hacks by the way. If I ever decide to get up off the couch, I will have to try some of them. Thank you Courtenay for sharing this helpful information. I wanna start a blog and when I read this it gave me some good direction to follow. I have just turned 64 and due to retire pretty soon, and have been fretting over what I am going to do once I am home 24 hours a day. This has just solved my problem. I think I would love to start a blog. Thank you for your advice, I will definitely be using it soon. Hi, I have been in the food and beverage business for 30 years now, and really burned out with it, my husband suggests I quit my current job, because I’m pretty miserable with it, but I really need to do something if I’m going to stay home, and I have always loved to write, so I’m just wondering if this is something I should look into ? Do you have any suggestions or tips for me to decide if I think I would be successful at it ? Hi Cindy! The number one most important thing that will bring you success with blogging (in my humble opinion) is consistency. If you’re someone who can get into a schedule that’s sustainable for you where you can stick to your blogging and writing consistently, you’ll definitely start to see results as far as traffic, new readers, and income potential are concerned. There are of course more ways to measure success though! If you’re just looking for a creative outlet and a way to connect with people in a meaningful way, blogging is great for that as well! Looking for recipes for tomatoes … and tomato sauce to freeze. It’s obvious that you have a very successful Blog. I’ve been following your site for well over a year now and enjoy posts. I’m a 75 year old Guy who needs to supplement my Social Security income. I have an extremely wide interests in many subjects. I am a veracious reader and I love to write. My simple question is “How do you make money Blogging ?” I simply do not understand this concept. Thanks for any help you can share on the subject! Hi Raymond! So glad you’re interested in starting your own blog! There are really an endless number of ways to make money from running a blog. Some of the most basic ways are to run ads (find an add management company to place them on your blog for you), work with brands on sponsored posts, and use affiliate links (such as from Amazon’s affiliate program) in your posts so you earn a small commission when your readers make a purchase after visiting your site. Hope that will help to get you started! How do you get paid and by whom? Each time someone goes to your site or what? There are so many different ways to earn an income from a blog, but one of the simplest is to run ads, so yes, you earn a tiny bit of money each time someone loads a page on your site. I have an ad management company that takes care of my ads for me and then sends me a check each month according to how many page views I had and which adds showed up on my site while people were visiting. That’s probably the easiest way to get started with monetizing your site! How do you find an ad management company? I’d like to add a blog to my existing website. Is that possible? Hi Carol! If you google it, you’ll find that there are thousands of ad management companies and more and more are popping up all the time. It never hurts to just try one out and see how you like working with them if you find one that seems like it would be a good fit for you. I used to work with a lot of different companies but I’ve been with AdThrive for about six or seven years now. I know a lot of my colleagues also work with Mediavine and have had a great experience, so those are a couple to check out for starters! Thank you for sharing Courtenay. The information is very helpful and useful as I start my own blog.